Learn how to use some of the most innovative paper crafting products. You will see multiple examples of finished designs and detailed instructions so you can make items on your own! Every year I go back country camping with a friend and this picture is from a sunrise 2 years ago. The views are truly spectacular and you can't help but relax. We haven't yet tried fishing but there is always this year! This design allows you to use a picture of a favourite fishing spot of any avid fisherman/fisherwoman and make a truly personal card! Cut a piece of black card stock measuring 5 ¾” x 8 ¼” and fold in half. Cut a piece of grey card stock measuring 3 7/8 x 5 5/8”. Die cut the largest oval from the nested oval dies in the center of the grey card stock. 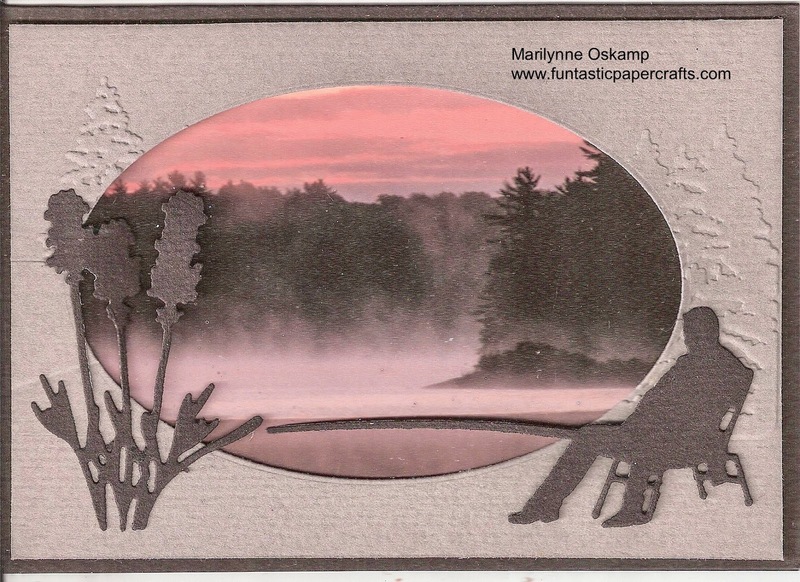 Emboss the grey card stock using the Nature scene embossing folder. Adjust the card stock so the pattern of the trees will be to the best advantage. Die cut the fisherman and the floral grouping out of black card stock. Attach a picture to the black card (optimizing the scene shown in the oval) using double-sided tape. Add the grey card stock on top of the photo using foam tape to add depth between the frame and the photo. Attach the fisherman and floral grouping using a few small foam tabs to the edges of the oval. Hi Everyone, I have been working with different paper crafts for the last 13 years! I generally like to make cards but also have used many techniques with scrapbooking. The first paper craft that caught my attention was embroidery on paper. I love the elegant look. However, since the first embroidered cards I made I have also perfected the techniques of paper piercing, Spirelli string art, parchment paper craft, Iris Folding, and paper toile or decoupage. 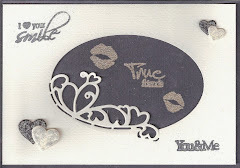 I also have experimented with the many ways to use outline stickers as well as embossing folders and the die cutting. What I love most is combining all of the above crafts to create that special project or card! I am the author of "Fun with Paper Crafts", and have appeared on The Home Shopping Network (HSN), DIY, and Scrapbook Memories. My designs have appeared in the magazines such as CardMaker, Paper Crafts, and Paper Creations. On this blog I hope to share with you the above techniques and more by providing you with designs as well as tips and instructions so that you can be successful in your paper crafting too!